Arthur J. Gallagher is one of the UK’s largest credit insurance brokers, operating from a strong regional office presence. Boasting a tremendously loyal and experienced team, our Account Directors all have over 20 years credit insurance experience each. If you are new to credit insurance, then look no further - we will help identify the structure most suitable for you and secure the best deal and coverage available. If you are presently insured and are looking to benchmark your current arrangements or you use a broker but would like a second opinion - we are here to help. We arrange all types of credit insurances structures depending on your needs – from simple to complex solutions - including wholeturnover, excess of loss, major buyer, specific account, named buyer and top-up. Arthur J. Gallagher is one of the top 3 UK retail brokers* and holds the prestigious Investor in Customers 3Stars Award for “Excellent Service”. 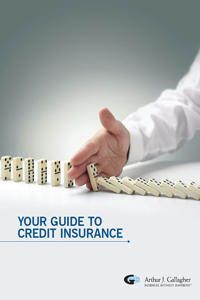 To find out more call us now on 0844 963 2132 or e-mail us at creditinsure@ajg.com. *Based on the combined brokerage of Arthur J. Gallagher’s commercial broking business according to the Insurance Times Top UK Commercial Brokers 2013 as published in September 2013. Arthur J. Gallagher (UK) is a trading name of Heath Lambert Limited, which is authorised and regulated by the Financial Conduct Authority. Registered Office: The Walbrook Building, 25 Walbrook, London, EC4N 8AW. Registered No. 1199129 in England and Wales. Sponsoring an issue of Credit Insurance News Digest is a great way to promote your company or brand to a committed audience of trade credit insurance professionals. If you are interested in sponsoring an issue in 2015 see our sponsorship page for further information. Copyright © 2015 Credit Insurance News, All rights reserved. Reproduction or redistribution in whole or in part, in any manner, without the express prior written consent of the copyright holder, is a violation of copyright law. Want to subscribe to our FREE Service? Register to join our mailing list and receive notification and a link to each Credit Insurance News Digest as it is published.